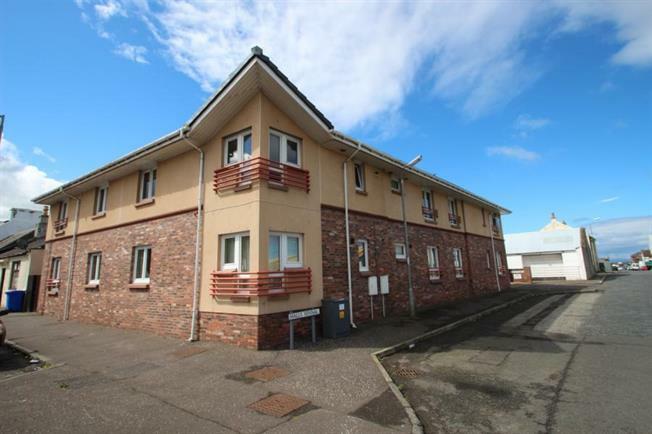 1 Bedroom Upper Floor Flat For Sale in Ayr for Offers Over £79,000. Well presented and spacious one bedroom first floor apartment ideally located for access to the town centre and a range of local facilities and amenities. Internal accommodation on offer extends to reception hallway, lounge/diner, kitchen, bathroom and double bedroom. This modern and stylish apartment further benefits from having a private off-street allocated parking space and use of a south facing communal courtyard. Access is by way of a pleasant communal hallway and on in to the apartment's reception hallway with laminate flooring and doorway access to the generously proportioned lounge with two double glazed windows. The modern kitchen benefits from a range of wall and floor mounted fitted units, fridge, washing machine and integrated appliances to include a freezer and gas hob with oven under and hood over. The bathroom is of a good size with suite comprising pedestal wash hand basin, WC and bath with mains fed shower over while the double bedroom completes the internal accommodation and benefits from a built-in double wardrobe. This attractive property will hold wide appeal to all including Buy to Let Investors and is situated in an area where regeneration plans are already in place.